Below your feet, hundreds of brightly colored umbrellas paint the picturesque beach. Above, a shimmering parachute suspends you as you glide soundlessly through the air. Then, seemingly out of nowhere, a falcon swoops in with expert agility, matching pace. A kinship is formed with your new feathered friend as you sail upwards together on the warm currents. The sport of parahawking, or paragliding in partnership with a bird of prey, is an opportunity to experience flying like a bird. 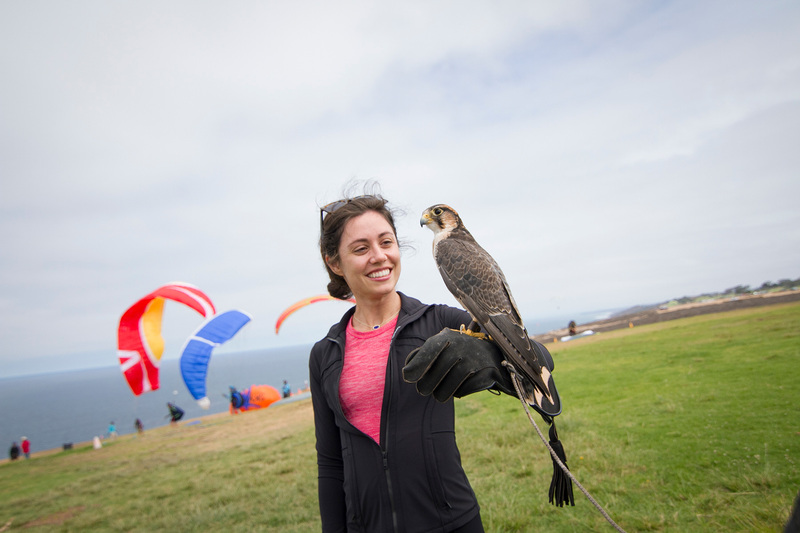 And the Torrey Pines Gliderport in La Jolla is one of the only places in the world where the public can don a harness, jump off a seaside cliff and soar with a raptor. 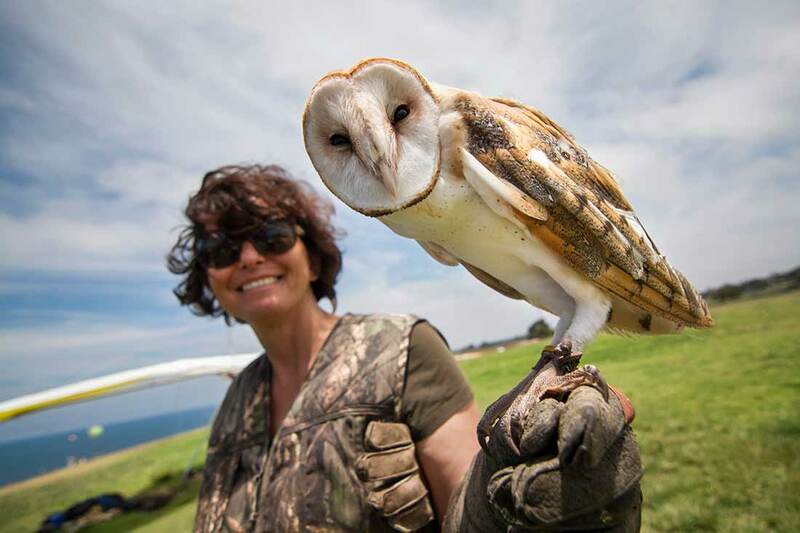 Antonella Zampolli is one of three instructors of the group’s falconry school. The campus and local community can engage in up-close encounters with trained birds of prey, like Henson, a barn owl. David Metzgar—a biologist, paragliding pilot and conservation educator—is eager to connect people with native birds of prey, both on land and in the sky. 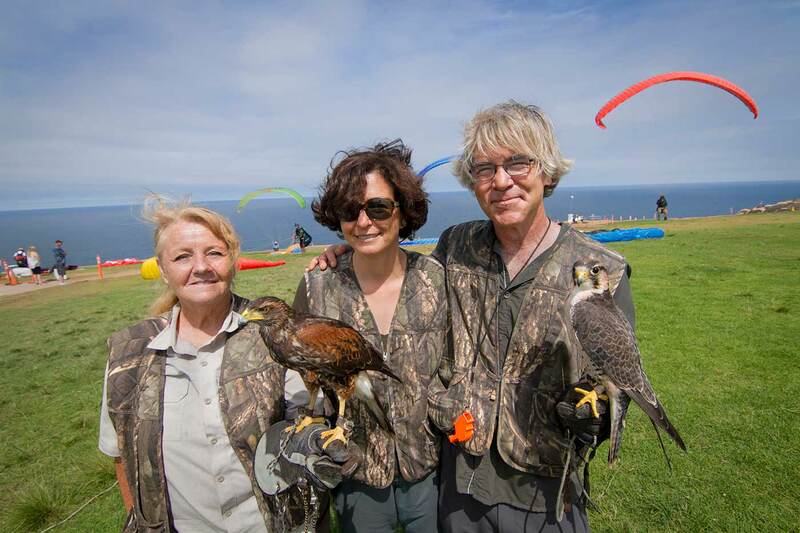 He co-founded Total Raptor Experience in 2013 with his wife, Antonella Zampolli, and business partner Terry Lockwood. Together they host weekly interactive educational programs with hawks, falcons and owls. Metzgar has spent his whole life studying nature, animals and microorganisms. After earning a doctorate degree in biology from UC San Diego in 2001, he worked as an epidemiologist for the U.S. Navy developing molecular diagnostics for infectious diseases. Though he still works part-time in the diagnostics industry, he dedicates the majority of his energy to Total Raptor Experience. Five years ago, Metzgar began training his falcon, Bunco, to fly alongside him. A Lanner falcon, these birds are known to be among the best pilots on the planet. Their tightly packed feathers are designed for aerodynamic flight, enabling them to sweep in on prey unnoticed at up to 90 mph from heights as great as 2,000 feet. It can take years to train a bird to fly freely and return—Metzgar uses a whistle or even calls Bunco affectionately by name—as well as become accustomed to crowded environments. And Torrey Pines Gliderport is nearly always bustling, with colorful parachutes gliding this way and that along the alluring coastline. The invariably smooth wind conditions, which drive westward and produce consistent lift for gliders, has made the iconic cliffs a magnet for free flight pilots for over a century—including Charles Lindbergh, who set a gliding distance record there in 1930. In fact, gliders learn from birds how to more effectively find and navigate within thermals, or warm columns of air that rise up. In 2016, a team of physicists and biologists at UC San Diego found that migratory birds expertly detect and navigate these currents so that they can glide great distances without expending too much energy. 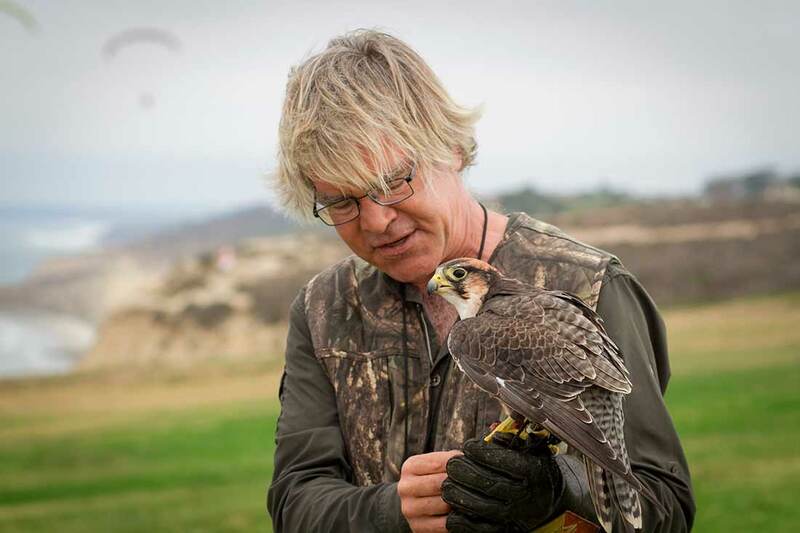 On weekends, Dave Metzgar will demonstrate the incredible flying capabilities of the lanner falcon, which hunts birds in the air using impact and speed. For those who prefer to keep their feet on the ground, the trio also conducts a falconry school that invites participants to engage in an up-close encounter with falcons and hawks. Lockwood—a master falconer and self-proclaimed “bird nerd”—begins the class by telling the tale of how the historic sport of training a bird of prey to catch wild quarry originated 4,000 years ago. In the tutorial, each person is provided a left-handed leather glove and taught how to position their body in preparation for the hawk to land—left foot and shoulder pointed forward, keep your arm flat, don’t move the glove in front of your body. After forming a circle, a Harris hawk named Leath coasts gracefully from glove to glove, rewarded each time with a small piece of quail meat. Other birds make their debut throughout the day, including a Eurasian eagle owl with hypnotizing orange eyes named Henson and a barn owl named Moonshine that likes to dance to music. Adults and children alike flock to the birds, eager to capture a photo and ask questions. Metzgar, Lockwood and Zampolli take the opportunity to provide conservation tips, such as refraining from using rat poison, avoiding lead sinkers when fishing, as well as posting UV tape on windows to help warn birds of glass. Lockwood, Zampolli and Metzgar are passionate about introducing falconry and the sport of parahawking to the local community. Should There Be Open Borders?